Baby Update: 10 months old! We have had quite an exciting month watching Aurora grow and learn! Time is speeding by and she is turning into such a sweet (sometimes sassy) little person. Height and weight: Not sure about height as we wont get that measurement till her 12 month check up. However, the little chunk is weighing in at around 22 pounds! 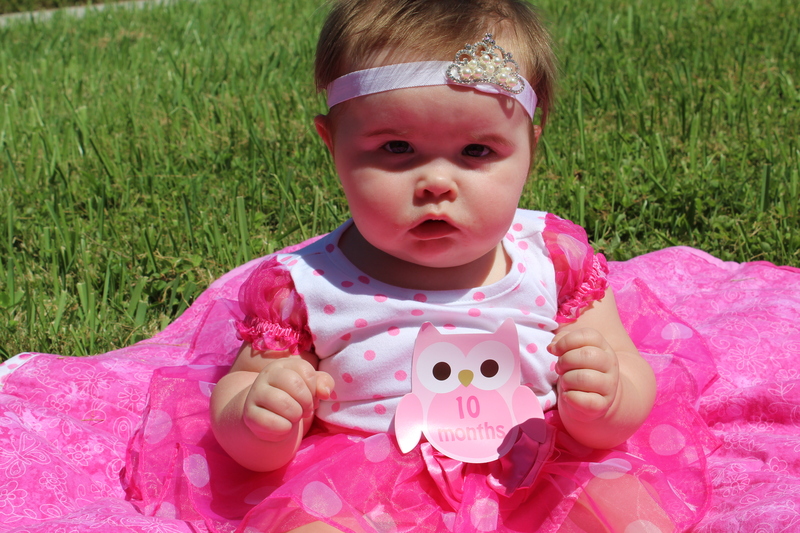 Clothing: Aurora is quickly outgrowing 9 month clothing…9-12 months and some 12 month clothing fits. We fit 12 month shorts in the thigh area…the rest is a bit big. Shirts fit in the width, not the length. Sleeping: Aurora likes to fight bedtime, but thanks to Daddy, he found the secret to getting the peanut to sleep…music! He puts on some tunes (of all genres) and off she goes to sleep. Food: What does this girl NOT eat? She literally loves EVERYTHING! We still have milk every 3-4 hours. Aurora loves puffs, yogis, and anything mummy and daddy will let her try! She even is getting to eat with the older kids at daycare now for meals and snacks. A new favourite (introduced by her Gami) is pineapple! Little girl loves her some pineapple! Noises and sounds: Aurora now says, “mumumu” which obviously is her way of telling me how much she loves me. She also loves to babble and make noises all the time. Milestones: WE HAVE A CRAWLER! Yes, that is right, as of last week, we have ourselves a little crawler. Let me tell you, that girl is FAST too! The first thing Aurora crawled to? The dog’s stinky, slobbery toy rope. No need to crawl to your own toys…go get the smelly one the dog chews on. Gross. Oh well, it at least got her crawling! Now, let all the mischief begin. Favourite things: Aurora has recently figured out she likes to play “peek-a-boo” with Daddy. Aurora LOVES watching Mickey Mouse Clubhouse, TMNT, and Peppa Pig. Aurora loves playing with her friends at daycare…even more now that she can follow them around! Aurora likes to crawl and touch all the things…even when she is not suppose to. She also loves crawling on/petting Morrison, tickles, cuddles, and bath time. Dislikes: Naps (crazy kid..), putting on clothes, not getting attention, and people not sharing their food. Fun Things: We had a mini photo shoot with Aurora in some of her cute Disney Baby outfits…she makes a pretty adorable little Snow White. Mummy and Daddy’s favourite moments: Mummy LOVED seeing Aurora crawl for the first time, and seeing how much happier she is now that she can get herself around. Daddy also enjoyed seeing Aurora crawl…and he loves Fridays when Aurora stays home from daycare and stays with him!